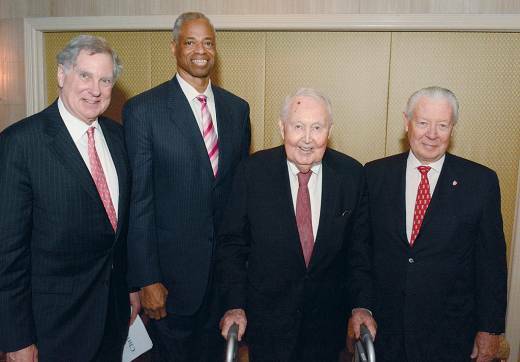 CYO Board President Chris Gallagher, left, stands with this year’s honorees at the annual CYO Club of Champions Tribute at the Waldorf Astoria. To his right are: Leonard Elmore, recipient of the John V. Mara Sportsman of the Year Award; Francis Rooney, winner of the Terence Cardinal Cooke Humanitarian Award; and Timothy Rooney, Gold Medal recipient. The 78th Club of Champions held on June 5th, 2014 at the Waldorf Astoria. Please click here to read about the wonderful evening supporting the great work of the CYO Community.